I’ve always LOVED sticky toffee pudding, but I wanted to give this classic recipe a twist. So I decided to make a cupcake, perfect for a afternoon tea. This recipe is everything quintessentially British, it’s sweet, sticky and scrumptious. If you’ve never tried it before, then you’re seriously missing out! This recipe came about because last weekend I received a lovely email from Denby regarding a competition called the ‘Cake-Off‘. If you didn’t know already, Denby is an English pottery company, they create the most beautiful and mesmerising bowls, plates and different crockery that is high-quality and simply stunning. The Cake Off is to celebrate the current series of the GBBO (Great British Bake Off), which is airing in the UK at the moment. So when I read the email, asking me to take part, I jumped at the chance! So here is my bake, which I hope you will all love! The recipe would be perfect for any afternoon tea spread, I love to decorate with fudge cubes and even more sauce! The sauce compliments the sponge and adds a little bit extra indulgence! 1. To make the cupcakes: Soak the dates in 150ml of boiling water for 20 minutes. Cream the butter, sugar and vanilla together for 5 minutes, until really light and fluffy. Then add the eggs, one by one and mix on a low speed until just combined. Then add the flour and mix until there no are lumps of flour left and the cake mixture is smooth. Break up the dates in the water and add all the date liquid/mixture to the batter. 2. Scoop evenly into 12 cupcake cases and bake for 15-20 minutes at 180 degrees C Fan until nice and golden and make sure a cake tester comes out completely clean. Once cooked, cool in the tin for a few minutes, then carefully remove and cool fully on wire rack. 4. For the buttercream: In a stand mixer fitted with a whisk attachment, beat the icing sugar with the softened butter for 5 minutes or until really pale and fluffy. Then on a low speed add your desired amount of toffee sauce- don’t add too much as you don’t want the icing to be too runny. Fill a piping bag fitted with your favourite nozzle (I used a small open star-tip) and pipe the buttercream onto the cupcakes. Finish with chopped walnuts or fudge pieces and make sure you serve each cupcake with extra sauce! I too am a rabid fan of sticky toffee pudding and even will buy it packaged (gasp!) at my local “deli” that is owned by a British couple and they have a number of things I don’t see at my local grocery store such as pastis, kidney pies and . . . sticky toffee pudding! I love these little cupcakes! The cupcakes are so pretty and I love sticky toffee pudding!! Thanks Suzanne! So happy you like the recipe! Gorgeous cupcakes and I bet the flavor is superb! 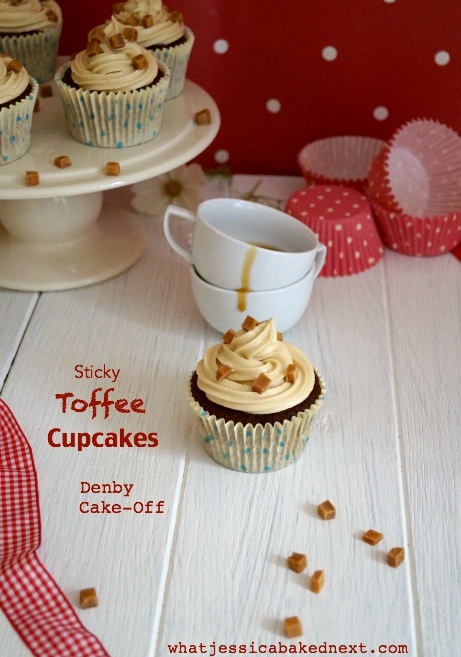 I’ve never had sticky toffee pudding before, but after seeing these cupcakes I’m dying to try some! The pictures are absolutely beautiful too. Thank you Danielle! You really must try sticky toffee pudding soon, it’s amazing and so good! Glad you like the recipe! Yay,the Cake-Off sounds like so much fun! These cupcakes are gorgeous Jessica! I’m drooling over the sticky toffee and fudge pieces. 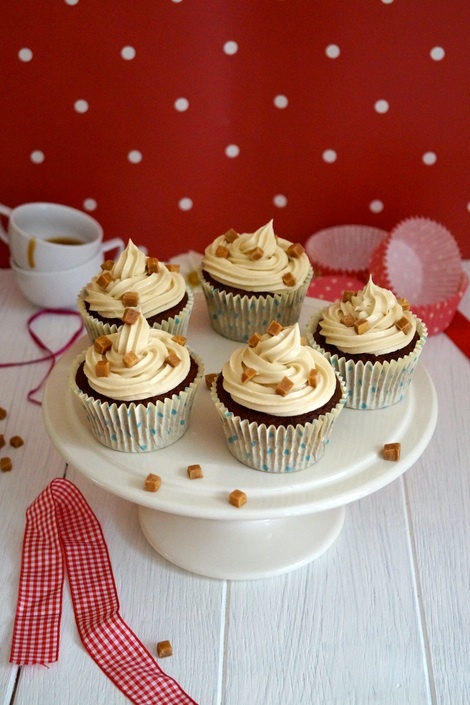 I love sticky toffee pudding, these cupcakes sound like heaven! I have wanted to try sticky toffee pudding forever now. I LOVE everything about these cupcakes–definitely saving this recipe! Thanks for sharing!! Sticky toffee pudding is one of those classic comfort food desserts. Love your twist on it! These look delicious!! Definitely going to try making them. These look like the perfect cupcakes, Jess! I love the toffee flavor! Pinned! Jess, these babies look delicious! Do you deliver? I yet have to find a recipe of yours I don’t like, lovely! Woah! These look awesome, Jess! I’ve had “make something with sticky toffee pudding” on my list ever since I saw this awesome dessert on our trip to Belgium last Spring. Two thumbs up on these cupcakes!! How fun are these? I have never had sticky toffee pudding (gasp!) but know these cupcakes would be right up my alley. What’s not to love? The name itself is making me want one right now! Oh these sound amazing! I’ve never had sticky toffee pudding. I need to try some soon! 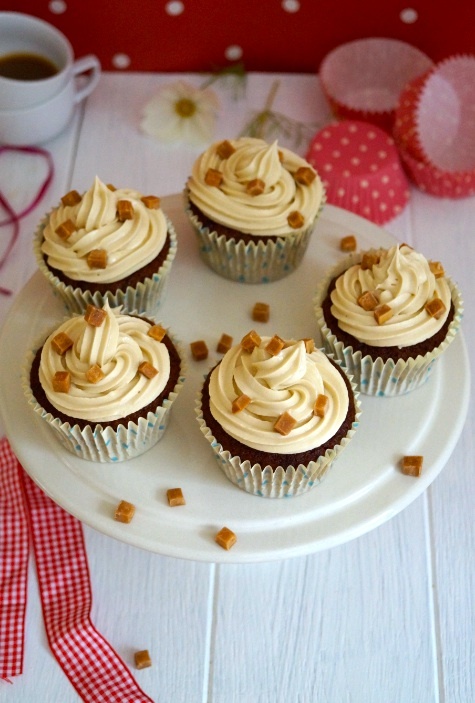 Love these Sticky Toffee Pudding Cupcakes!! and love the little fudge cubes!! so cute! Well done, Jess! The addition of dates and brown sugar sounds mouthwatering delicious! Would you know I’ve never tried sticky toffee pudding? In know, whaaaa? But, these cupcakes look fabulous (love the crockery too!). Thanks Traci! You really must try sticky toffee pudding it’s amazing! Glad you like my pictures and styling! These cupcakes look super cute AND delicious. I want one! Jess, I’m so bummed that I’m in Australia at the moment and missing the bake-off! I love that programme! Your muffins look literally perfect … you could quite easily sell those professionally! Thanks Helen! I would love to be living in Australia! The bake-off has been really exciting and there are so many bakes that I would love to make! What a fun idea for fall! 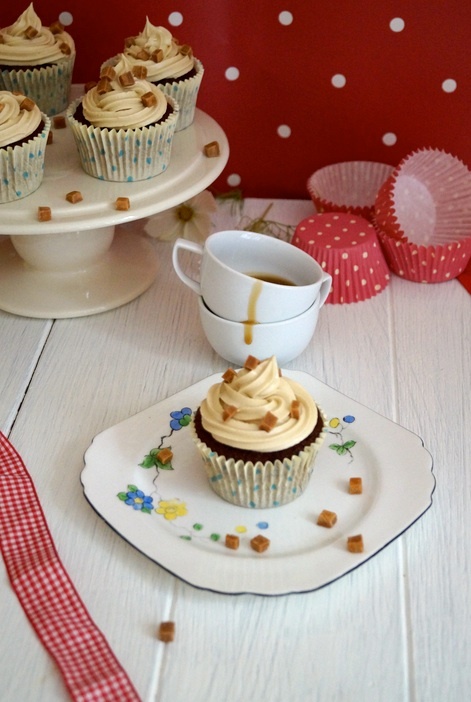 I love sticky toffee pudding and that toffee buttercream sounds amazing! Thanks Allie! It’s a great Autumn recipe- so fun and very delicious! Congrats on the bake-off, Jessica, and these look absolutely delicious! 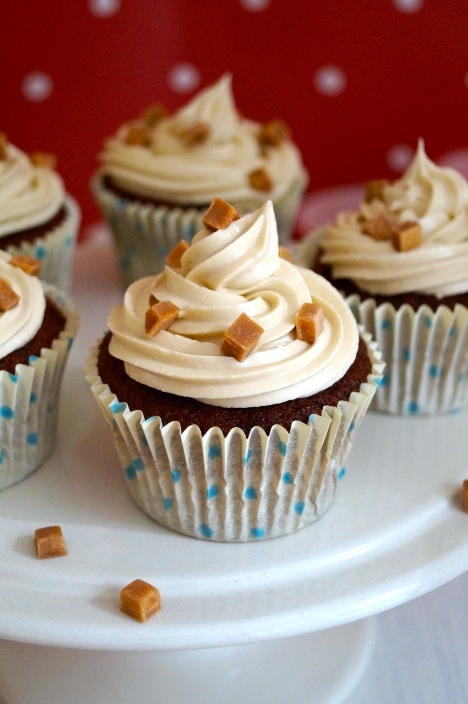 That toffee buttercream sounds AMAZING! Thanks Marcie! Hopefully my recipe will do well in the competition- fingers crossed!! Glad you like the buttercream, it was amazing!